My laboratory is interested in understanding the mechanisms that contribute to the development of heart disease. The heart functions as a pump that cycles between contraction and relaxation in order to provide nutrients and oxygen and remove waste from all organs. Multiple risk factors are known to cause malfunctions of the heart, including diabetes, obesity, aging and ischemic heart disease (heart attack). Our lab focuses on how metabolic disorders, specifically diabetes, lead to these malfunctions. We induce diabetes in mice and measure contraction and relaxation functions with ultrasound to trace what goes awry in diabetic hearts. A number of theories have been proposed on how metabolic disorders contribute to the development of heart disease. We focus on an emerging area of research centered on a molecule called NAD+. NAD+ is a crucial part of our cellular metabolism and acts as a moderator of metabolic processes. For example, as cells break down sugar and fat for energy, NAD+ is a critical facilitator for the flow of these metabolic processes. 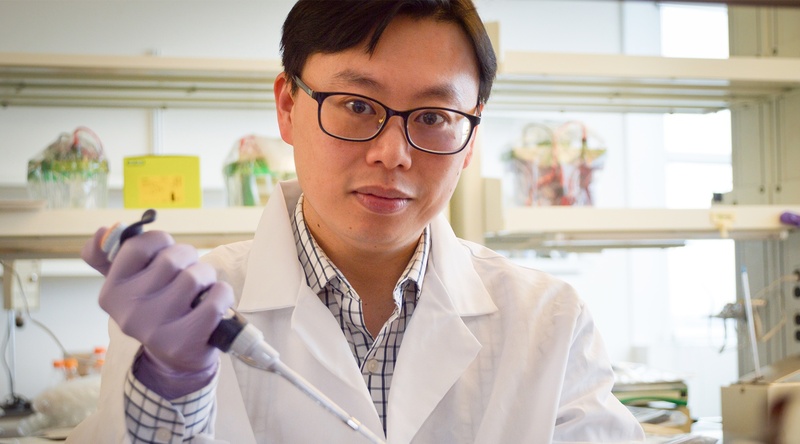 Studies from the past decade have started to expand our understanding on how this molecule regulates other cellular processes and, ultimately, contributes to heart disease. NAD+-dependent pathways have emerged as promising therapeutic targets in multiple diseases. Our goal is to identify novel NAD+-dependent mechanisms that contribute to the pathogenesis of heart disease. We hope that our studies will result in improved treatment options for patients to slow, reduce or even prevent disease progression. Our laboratory studies how metabolism affects pathogeneses of heart and mitochondrial diseases. We are particularly interested in the emerging roles of NAD+ metabolism in these diseases. Recent studies highlight the importance of NAD+-dependent pathways in mitochondrial and cellular functions, disease pathogeneses and therapeutics. Our goal is to discover how NAD+ metabolism is involved in disease pathogenesis and to use knowledge gained to improve therapeutic strategies. Diabetes, hypertension and aging are important risk factors for the progression of heart failure. We recently described the roles of NAD+ redox imbalance in promoting heart failure progression induced by chronic pressure overload (a hypertension model). Our laboratory now focuses on determining the roles of NAD+ metabolism in cardiac dysfunction induced by metabolic disorders such as diabetes. Using multi-omics analyses and genetic models targeting NAD+ metabolism, we will dissect how NAD+ metabolism plays important roles in cardiac dysfunction induced by diabetes, and by other risk factors of heart failure. Our laboratory also works on understanding how NAD+ metabolism contributes to the pathogenesis of mitochondrial disease, e.g. Leigh syndrome. Patients with Leigh syndrome harbor mutations in mitochondrial genes and manifest neurometabolic disorders, cardiomyopathy and early death. We recently showed that elevations of NAD+ levels improve lifespan and healthspan in a mouse model of Leigh syndrome. Using the tools and models targeted for NAD+ metabolism, we hope to identify disease mechanisms and to further improve therapeutic strategies in treating mitochondrial disease.